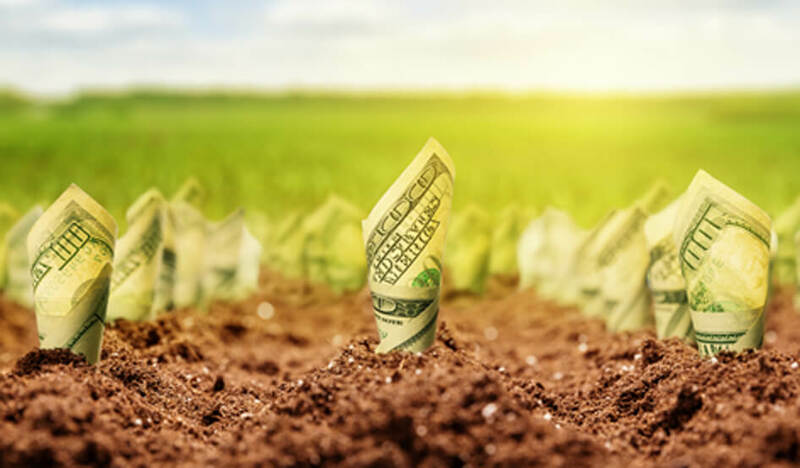 Who funds the grassroots anti-GMO movement? There is a lot of misinformation about GMOs online. But why is that? Where is this info coming from? Well, the answer is quite clear once you do a little digging, and there is a lot of money to be made off of consumer fear. Sometimes when I defend GMOs online, people accuse me of being paid by Monsanto. Well, I’m a farmer. They don’t pay us, we pay them. And that argument is silly because we have hundreds of seed companies to choose from, and they’re not even the biggest. To think that they are the only company that cares about profits is just plain naive. The more than $39 billion organic industry cares about profits! Food companies care about profits! And frankly, they’ll do whatever it takes to make a buck. 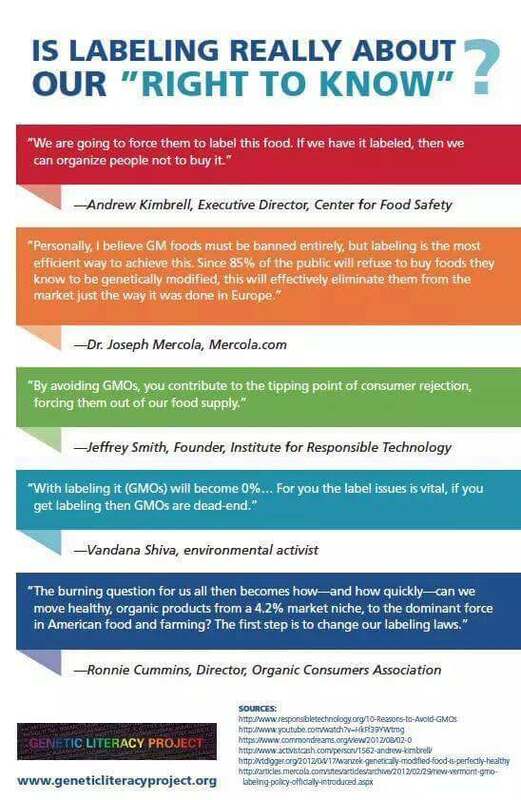 The organic industry has made it very clear that they want GMOs labelled. By creating a label, this will stir up doubt and fear, which will ultimately push GMOs out of the food supply, thus boosting profits for organic companies. 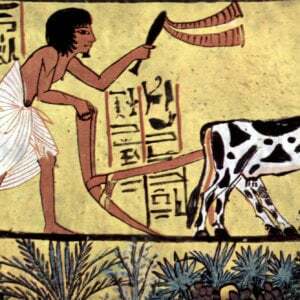 But everything we eat has been modified by humans. Why transgenesis in GMO but not mutagenesis in organic? Plant breeding is a process, not a product. 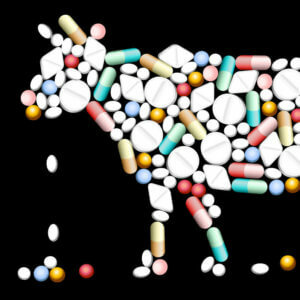 The people in this image are paid millions of dollars by organic and natural companies. “March against Monsanto” works hand-in-glove with the Organic Consumers Association, a vaccine denying anti-GMO activist group and one of the leading funders of anti-GMO activist groups. If March Against Monsanto is just a simple grassroots organization, how can they afford expensive billboards in New York City? Moms Across America has “go organic” billboards all across the country. How can they afford this? 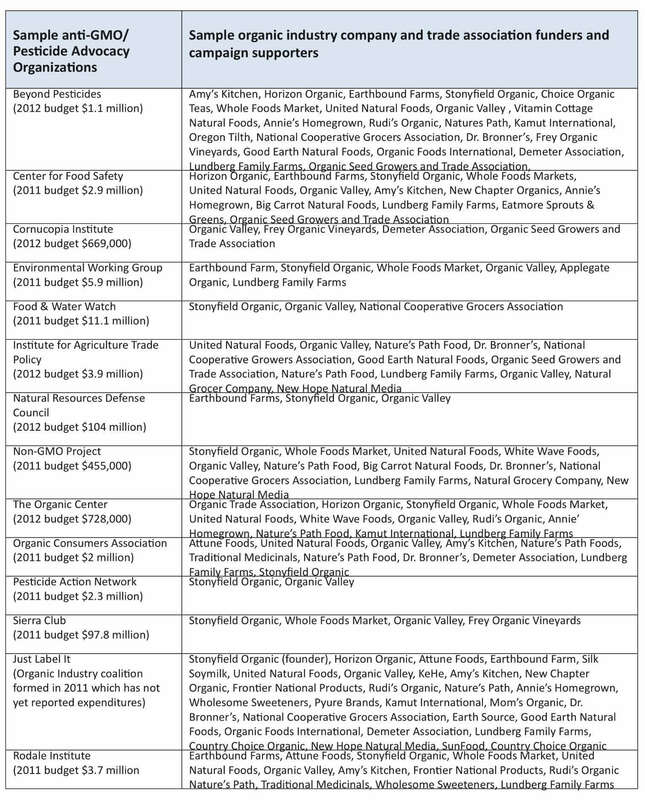 These people have an agenda, and the organic food industry actually spends $2.5 billion annually through 330 different organizations leading with fear to sell their products. Fear sells and marketers know it. I highly recommend reading this in-depth Organic Marketing Report. This shows the money trail; it’s a real eye opener and discusses how the organic food industry purposely targets new parents and other groups to push their products. They lead with false information that organic means pesticide-free, when in fact … it does not. Organic agriculture certainly uses pesticides, many of which are more toxic than their non-organic counterparts and/or are applied at a higher dose. This shouldn’t scare anyone in general though, because the dose makes the poison. Pesticide residues are so minimal, you would need to eat about 800 servings in a single sitting to affect humans. Wash your produce and eat more fruits and veggies, no matter how they’re grown. The Organic Industry has also been an intricate part of online “documentaries.” Remember “Food, Inc?” Painting the picture of how beautiful Stonyfield Organic is as a company? Yeah, that wasn’t by coincidence — they did the funding. The CEO of Stonyfield is Gary Hirshberg who is also the founder of “Just Label it.” With help from friends Vani Hari, John Roulac of Nutiva and GMO Inside, the Organic Consumers Association, the Non-GMO Project, GMO Free USA, Ecowatch, Jeffrey Smith, Mike Adams from “natural news,” (the list goes on) they have played an important role in making money off of the anti-Monsanto, anti-GMO movement. It’s lucrative, as they paint scary images of syringes dancing inside tomatoes (there’s no such thing as a commercially available GMO tomato), frankenfood fearmongering, and scary masks with guys in hazmat suits. Conspiracy theories are exciting, science is boring. The narrator of one of Smith’s films is Dr. Oz’s wife, who is good friends with the natural health alternative (aka “quack”) companies that do their funding. Dr. Mercola is a good example as well. Everything is trying to kill you, unless they are selling it, of course. The activist web is thick, the intertwining of the agenda is real, the pockets run deep. To be clear, this is not meant to be a rip on organic farmers. All farmers are important. Big, small, organic or not. This has to do with the money trail and political agendas of huge corporations such as Whole Foods, Organic Valley, Nutiva, Stonyfield Organic, etc. Tell people GMOs are bad, and rake in the money. There is zero peer-reviewed evidence that GMOs pose alarm in humans, but this doesn’t stop them from running smear campaigns against conventional agriculture. They have also donated large amounts of money to political agendas to label GMOs. The Organic Consumers Association even threw thousands of dollars on the senate floor during the “label GMOs” bill, while Whole Foods executives claim non-GMO and organic food is the largest growing sector of food labelling. They’re probably right. When you spend billions of dollars telling consumers GMOs are bad, you’re bound to sway public opinion. The thing that bothers me about this the most is that non-GMO crops mean more pesticides and natural resources than their GMO counterparts, but this doesn’t stop them from continuing down their echo chamber of lies. 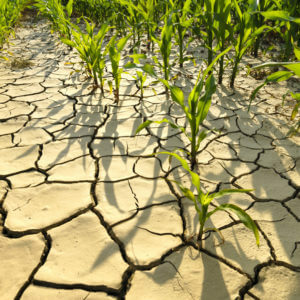 Over 90 percent of certain crop farmers in the U.S. grow GMOs because of the substantial benefits to the environment. This is why it’s so sad. 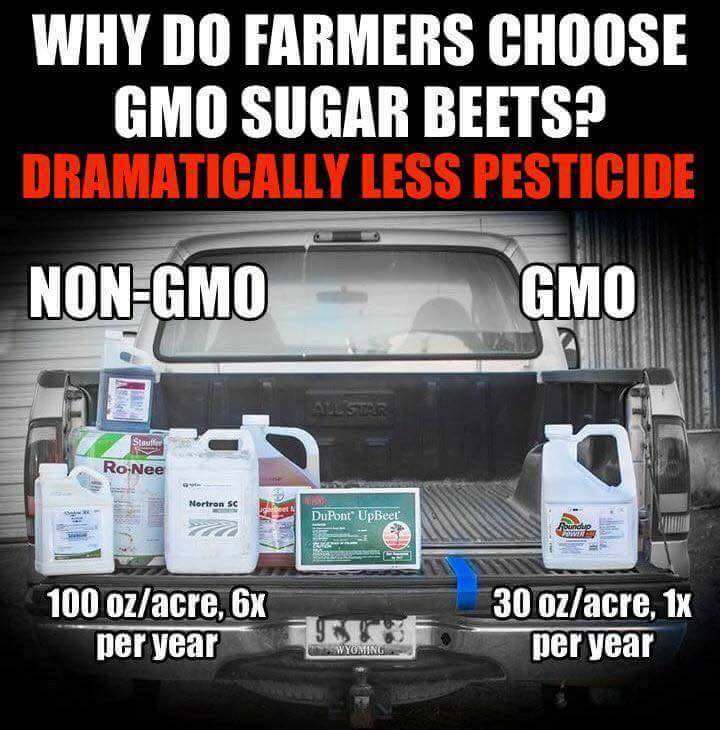 They claim GMOs are drenched in pesticides, but this couldn’t be further from the truth. Non-GMO actually uses more chemicals, but nothing is “drenched.” Silly. So why do food companies want more organic and non-GMO options? Think about it for a minute. Farmers make up less than 2 percent of the population of North America, and about 2 percent of them are organic. This means food companies must source their organic food on a large scale from places like China or other third world countries. Just like every other industry, “made in China” saves industries huge amounts of money. Then they charge more money to it based on marketing, and rake in the cash. I’m not talking about beautiful, small scale organic farms with Farmer Tom at the local farmers market here. (These are great.) I’m talking about large-scale corporate greed. Almost all of the people mentioned here have one thing in common: most of them have never farmed an acre of cropland a day in their lives. So why are we listening to these people instead of real large-scale farmers, agronomists, scientists? It makes no sense, and this is why people have to use critical thinking and common sense as to where they get their information. When desiring the real truth about farming, let’s discuss this with real farmers and not big city corporate executives or people with a computer science degree and a marketing scheme. 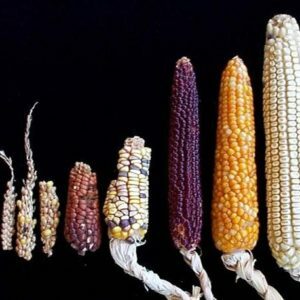 This column was originally posted on AGDAILY.com as Farm Babe: The fat lies and fatter wallets of anti-GMO lobbyists. AGDAILY can also be found on Facebook and on Twitter. Michelle Miller, Farm Babe (@thefarmbabe), raises sheep and beef cattle and farms with her boyfriend in Iowa. She believes it is important to bridge the gap between farmers and consumers, and does freelance writing and public speaking. View her blog on Facebook.